Welcome to Music Friday when we bring you classic songs with jewelry, gemstones or precious metals in the title or lyrics. 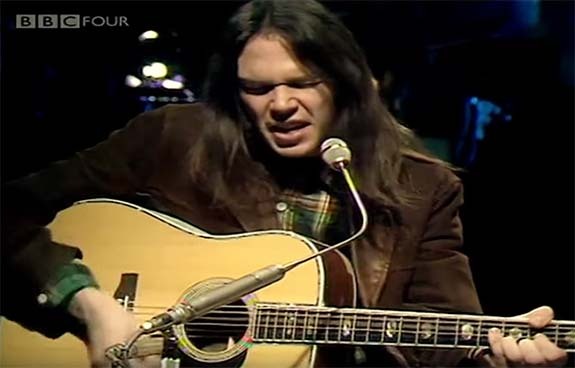 Today, the incomparable Neil Young searches for a soulmate in his 1971 chart-topping classic, "Heart of Gold." Penned by Young, this song is about a man who has been unlucky in love. The protagonist of the story wonders if he's ever going to find someone who will cherish him unconditionally. He sings, "I want to live, I want to give / I've been a miner for a heart of gold / It's these expressions I never give / That keep me searching for a heart of gold and I'm getting old." Ranked #297 on Rolling Stone’s list of the 500 greatest songs, “Heart of Gold” remains Canadian Neil Young’s only #1 on the U.S. Billboard Hot 100. The song also reached #1 on the Canadian RPM Top Singles list. Young had suffered a back injury and, unable to stand for long periods to play his electric guitar, returned to his acoustic guitar and harmonica. “Heart of Gold” was one song that came out of those sessions. Second, Linda Ronstadt and James Taylor happened to be in Nashville for a television appearance while Young was recording Harvest, the album on which “Heart of Gold” appears. The album's producer arranged for the high-profile artists to sing backup on Young's track. "Heart of Gold" has been covered by more than 30 artists, including Dave Matthews, Jimmy Buffett, Johnny Cash, Tori Amos and Willie Nelson. Canada’s CBC radio named it the third best Canadian song of all time and it was included in the Eat, Pray, Love movie soundtrack. Born in Toronto in 1945 to a sportswriter dad and quiz show panelist mom, Young contracted polio as a five year old. The disease damaged the left side of his body and led to seizures he would experience throughout his life. Young idolized Elvis Presley and listened to rock 'n roll, rockabilly, doo-wop, R&B and country and western music on the radio. Young taught himself to play a plastic ukulele, and he would soon step up to a banjo ukulele and baritone ukulele. Young formed his first band, the Jades, while attending middle school and eventually played with several rock bands in high school. Music dominated his world, so he decided to drop out of school to pursue a musical career. He formed the influential band Buffalo Springfield with Stephen Stills in 1966 and toured with Crosby, Stills, Nash & Young, starting in 1968. Young is one of the few artists who had been inducted into The Rock and Roll Hall of Fame twice. He was first honored as a solo artist in 1995 and then as a member of Buffalo Springfield in 1997. In 2000, Rolling Stone named Young the 34th greatest rock 'n roll artist. Please check out the video of Young's live performance of "Heart of Gold." The clip is taken from his 1971 appearance on the British TV show BBC In Concert. Written and performed by Neil Young.